"He complained about fatigue, and red blotches began to appear on his skin. His internal organs began collapsing one by one. Then he lost almost all his hair." This was how a witness described the mysterious illness which struck down 53 year old Yuri Shchekochikhin, a member of the Russian Duma or parliament, in June 2003. Within 16 days of falling ill Shchekochikhin was dead. And both colleagues and family suspect he was murdered. The strange illness of Yuri Shchekochikhin is one of a series of deaths investigated in Russia by File on 4 in the wake of the dramatic radiation poisoning of Russian exile Alexander Litvinenko in London last November. The common factor in these deaths is that in each case people close to the victim suspect that either the state or one of its security arms was involved. As a journalist Yuri Shchekochikhin was one of Russia's top corruption investigators. His colleagues say family members were told by medical staff that he may have died from "an allergic reaction". But more than three years after his death, his family are said still to be trying to obtain medical records and tissue samples to allow an independent scientific analysis to be done. A friend of Shchekochikhin, Kirill Kabanov, who is a former member of the Federal Security Service, the FSB, was travelling with him shortly before his illness. Kabanov says that among the targets of Shchekochikhin's investigations were very senior people in the FSB and in other state agencies. He recalls that with no official help, friends of the dead man mounted an independent assessment of the facts they knew. "We had our own investigation of Yuri's death," says Kirill Kabanov. And I personally had to use some of my old contacts from the security services. And the specialist whom I contacted said that with 90% certainty Yuri's case was a poisoning and most likely he was poisoned with thallium." Asked why doctors should give other reasons for the death and why samples should be unobtainable, Kirill Kabanov again draws on his secret service knowledge. 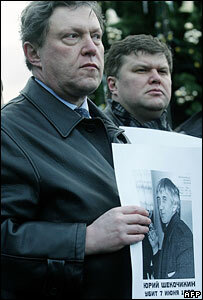 "Yuri Schekochikhin's treatment and his post-mortem took place at the Central Clinical Hospital. This is the most important clinic in Russia and it's tightly controlled by the Russian Federal Security Service because it treats top-ranking Russian officials." So could a cover-up have taken place? "Recently," says Kabanov darkly, "very few people in Russia find the courage to tell the truth." There are similar suspicions surrounding the death of another man, Roman Tsepov, aged 42, in St Petersburg in September 2004. Tsepov had been running a security agency since the nineties. He had even guarded the man who became Russia's president seven years ago, Vladimir Putin. After a business trip to Moscow Roman Tsepov fell ill and his condition went downhill dramatically, as his physician, Dr Pyotr Pirumov, recalled, in an account given to the agency for Journalistic Investigations in St Petersburg. "It was poisoning without a poison... It was as if his immune system was switched off." Again in under three weeks after falling ill the patient was dead. No clear cause of death was issued. And when we called Dr Pirumov he seemed nervous about the case and declined to grant an interview. But File on 4 has now learned that a few weeks after Alexander Litvinenko's death, the files on Roman Tsepov were requested from St Petersburg by the General Prosecutor's Office in Moscow and the case is now being handled from there. A claim made by a Moscow investigative journalist, Igor Korolkov, of the newspaper Novaya Gazeta, only deepens the mystery. "My source at the prosecutor's office in St Petersburg told me that a post mortem on Roman Tsepov showed he was contaminated with a radioactive element," says Korolkov. "And the quantity of this element in Tsepov's body exceeded the norm by one million times." Suspicions that the state, or its security or armed services could have had a hand in high profile killings are dismissed by the deputy chairman of the Duma security committee, Mikhail Grishankov. He is a member of the pro-Putin United Russia Party and is also a former member of the FSB. "Russia is now very different from what it was like back in the 1930s and 1940s," says Mikhail Grishankov. "And the myths formed in the West back in those times, are a hangover of the Cold War." "And this speculation about the alleged connection of the Russian security services - I see it as an attempt to bring these Cold War skeletons back to life!"